Since genetically engineered (GE) crops, foods, and animal drugs were brazenly forced onto the market in 1994 by Monsanto and the FDA, with neither pre-market safety testing nor labels required, consumers and small farmers worldwide have mobilized to ban, label, or boycott these controversial "Frankenfoods." With mounting scientific evidence1 underlining the human health and environmental toxicity of GE foods, and growing alarm over the toxic pesticides such as Monsanto's Roundup that invariably accompany genetically modified organisms (GMOs), currently 64 nations require mandatory labeling of GMOs. In the European Union (EU), where mandatory labeling laws are in effect, little or no GMO crops or food are on the market (except for imported GMO animal feed). In addition to banning GMOs, a growing number of countries, including El Salvador and Sri Lanka, have begun to ban the use of Monsanto's Roundup. This type of chemical use has got to stop. 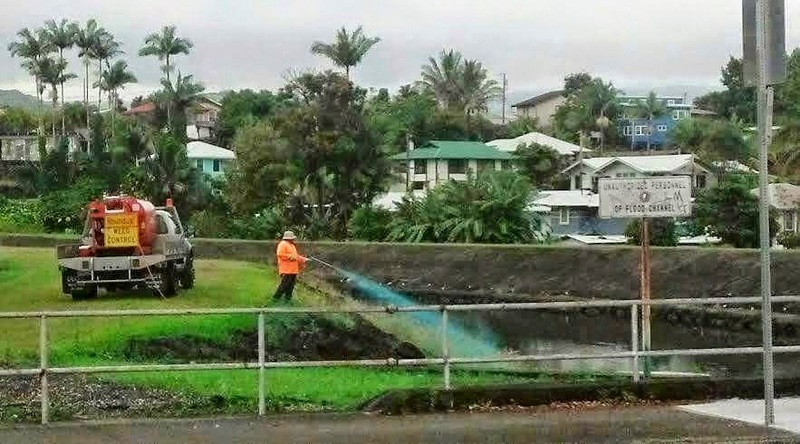 Really, spraying a known carcinogen right into the canal in Hilo Hawaii, is one of the many abuses of toxins found in agriculture. This has got to stop. We want the county council to cease the funding of, and stop the county's use of glyphosate & neonicotinoids, immediately and permanently. May 11th, 2015 - Video by Kami Carter of county workers spraying RoundUp in a pedestrian friendly residential neighborhood of Kamuela/Waimea, Hawai'i Island. It's time for Hawai'i County to stop all spraying of Neonicotinoids and RoundUp/glyphosate, in our parks, on our roadways and streams. There is ample evidence to heed the precautionary principle for the protection of Hawai'i residents, visitors, property, and wildlife, now. The International Agency for Research on Cancer, the specialised cancer agency of the World Health Organization, asked a group of experts to spend a year examining the data from peer-reviewed studies about glyphosate. The research found that the herbicide, along with two other insecticides, was classified as “probably carcinogenic to humans” — a description used when there is limited evidence of cancer-causing effects on humans, yet sufficient evidence of it in animals. Many countries and several U.S. towns & cities have banned or stopped spraying glyphosate or are planning to - with many more to follow. As recently as 5-11-15, members of the Bermuda farming community supported the Government’s decision to ban the importation of the weed spray Roundup amid fears that it can cause cancer in humans. May 6, 2015 - The City of Boulder, Colorado yesterday became the most recent locality in the U.S. to restrict the use of bee-toxic neonicotinoid (neonic) pesticides on city property. Neonicotinoids have been widely cited in the demise of both managed and wild bee and pollinator populations. Acting as potent neurotoxins, studies have found the insecticides have the ability to disrupt the reproduction, navigation, and foraging of bees exposed even to infinitesimal concentrations. There are many non toxic and less expensive alternatives to weed control and we, the residents of, and visitors to Hawai`i County, ask that you make this necessary change. We ask that the County stop all use of glyphosate and neonicotinoids immediately and permanently. Mahalo to the Hawai`i County Council for protecting us sooner, rather than later. A big part of being a successful business is learning ways to manage risks. When your business is growing food, plants or flowers, insuring your crop can help protect you from financial disaster as well as cover minor set-backs in production. Though we hate to think of the possibilities, we do live in a place where storms, tsunamis, earthquakes, floods, droughts, fires or lava flows can negatively affect our crops. Of course, our frequent heavy rains and strong winds are lesser dangers, but they can also severely impact a harvest. Fluctuations in markets can also cause financial losses. Growers with crop insurance can face these potential problems with less anxiety knowing that if losses do occur they are covered. The US Department of Agriculture, in its efforts to keep agriculture viable in this country by helping farmers be sustainable, underwrites insurance for many crops. Many of the crops covered in this program are ones we grow here in Hawaii. Coffee and bananas are covered as well as papayas, macnuts and livestock with premium discounts available for beginning farmers and ranchers. A new Whole Farm Revenue Protection Program is being launched as well through the latest Farm Bill and will cover most crops including fruits, vegetables, animals and aquaculture with highly diversified growers receiving additional subsidies. The US Congress updates the nation’s Farm Bill every five years. The Bill is a comprehensive piece of legislation that covers federal government policies related to agriculture and includes many assistance programs for farmers. The latest version offers special benefits to new farmers as well as those with limited resources. The many programs offered through Natural Resources Conservation Service, the Farm Service Agency and its Risk Management Agency as well as the Agricultural Mediation Program are all part of the Farm Bill and designed to help farmers succeed. The programs serve the interest of USDA to make farming a sustainable occupation in this country. Though many small farmers feel the programs only benefit large corporate farms; that is not the intention of the USDA or the actual fact. Many of their programs can be very helpful to small and organic farms and growers here in Hawaii. We only need better access to information about these programs and their coverage dates. Sign up dates are especially important when insuring your crops against damage of any kind. Call an agent to determine the application deadlines. Trees of coffee, banana, papaya and macnuts as well as coffee and macnut fruit can all be insured. A new Whole Farm Revenue Protection policy covers most crops and may have a different deadline. Nursery crops can be insured at any time with policies taking effect 30 days after paper work has been filed, and livestock risk protection price coverage can be locked in anytime for growers that have an application on file with a carrier. Insurance Agent, Bonnie Lind represents two of USDA’s most experienced Approved Insurance Providers in our area: Rural Community Insurance Service and ProAg Insurance Services. To learn ways to protect your farm income from crop and revenue losses and to get an overview of programs that can help manage your farming risks, be sure to check with an agent. To contact Bonnie Lind directly call 888-276-7728 or e-mail agsecure@sbcglobal.net. If you are growing and selling crops, be sure to consider crop insurance as a way to responsibly manage natural and marketing risks that can cause crop and revenue losses to your business. Diana Duff is a plant adviser, educator and consultant living on an organic farm in Captain Cook. Tropical Gardening Helpline E-mail plant questions to konamg@ctahr.hawaii.edu for answers by Certified Master Gardeners. Some questions will be chosen for inclusion in this column. Answer: Several conditions can produce citrus fruit that lack juice. Your elevation and the location of your tree can be factors. Juiciness can be affected by weather conditions as well as soil type, irrigation frequency and nutritional contents in the soil as well as pest issues. Your sample did not seem to have any pest problems. Citrus trees do best with a good consistent moisture level. One way to be sure that they get sufficient moisture is to install a drip irrigation system around the root zone of the tree. Several mineral elements can affect juice content of the fruit. For example, nitrogen can help increase juice content and acid concentration, but it can also increase the thickness of the peel and it needs to be balanced with other nutrients as well. A proper balance of major nutrients including nitrogen, phosphorous, potassium and magnesium is necessary to produce quality fruit. It is recommended that you do a soil test before adding any fertilizers, however, so that you can add what is needed without risking toxic doses. Citrus fertilizers usually contain all the ingredients necessary for production of quality fruit. Though citrus trees can tolerate the heat at lower elevations in Kona, they may be adversely affected by salt spray at properties near the ocean. They also will do well at upper elevations in West Hawaii. Good soil drainage is important at any elevation. Another way to help citrus produce juicy fruit is to help keep their roots cool and moist and the soil in the root zone healthy by applying a thick layer of mulch to the area. We offer consultations on starting your new farm or improving your old one. & funded NRCS conservation practices that can help you on your farm. We can help you get low interest FSA loans and low cost crop insurance through USDA. We have crop lists with advice on what plants will work best for you in your location. We have a special livestock advisor that can help you add fish or animals to increase profit. We can help you develop a business plan to use to get a loan or get a new KS lease. AND we can do the paperwork for you. We are here to help….contact us to see how we can best serve you. Farmer’s organizations have a tough time. Farmers are an independent breed and, like cats, are hard to herd. The National Farmers Union is one organization that has stood the test of time at getting farmers united around agricultural concerns,however. The Union was founded in 1902,at a time when farmers were living very isolated lives on large pieces of land far from towns and other farms probably without all the connecting conveniences we have today. The Farmers Grange, the Farmers Union and the Farm Bureau all served as uniting forces for farmers in the early 1900s. Though many granges have had to go online to keep farmers involved, the Farm Bureau and Farmer’s Union still survive. Each has a Washington bureau that lobbies for agricultural interests in Congress. Each has somewhat different agendas, however. The motto of the Farmers Union is “united to grow family agriculture”. They are committed to the family farm and have policies that differ from other agricultural organizations especially concerning genetically modified crops. You can read their policies regarding biotechnology at http://www.nfu.org/nfu-2015-policy/2066#_Toc416184483. They recently have come out to support informative labeling of all products containing genetically modified crops. Here in Hawaii where concern over the proliferation of genetically modified crops is rising, an organization with policies limiting GMOs was bound to attract local farmers, especially those with small, organic farms. The Hawaii branch of the Farmer’s Union began holding meetings on Maui a few years ago. Oahu and Kauai now have active chapters and three chapters are getting going on the Big Island including ones in East Hawaii, Ka’u and Kona. The statewide organization has enjoyed a good year working with our state congress men and women to inform them of agricultural concerns and encourage their support for important bills. This weekend members of the Hawaii Farmers Union United will meet on Maui to do some strategic planning for the organization’s future statewide. Harley Danielson, strategic planning expert from the National Farmers Union, will be on hand to help with the process. Scott Enright from the Hawaii Department of Agriculture is expected to attend as well. One part of their strategic plan will certainly be increasing membership. The Hawaii chapters have shown a seven fold increase in membership this last year and are hoping to keep that momentum going. The localKona chapter is certainly part of that membership enthusiasm. President Steve Sakala is making sure to plan meetings that will interest farmers and attract new members. Currently the organization’s membership includes members from other key local agricultural groups including the Tropical Fruit Growers, the Kona Coffee Farmers Association, the Kona County Farm Bureau and the Kohala Center. Steve and his board are hoping to attract more local chefs as well as foodies and those interested in food security to join the Union as well. Thecurrent board members have planned an excellent program for their upcoming meeting on Wednesday, April 29 to be held at Yano Hall in Captain Cook, across from the Manago Hotel. Knowing how farmers love a good meal, this meeting will begin at 5:30 with dinner. Member Howie Simon and owner of the Lotus Café will be providing the main dish. Attendees are encouraged to bring a side dish to share. To add to the encouragement, those who arrive empty handed will be charged a fee for dinner. while others will give legislative updates and information about upcoming events of interest to farmers. Included in almost every gathering of farmers is a produce exchange. This meeting is no exception. Bring your excess and take home what you need. If you haven’t checked out the Farmers Union, this is a good opportunity to find out what they are all about. http://hfuuhi.org/hawaii-farmers-union-united/ and consider going to” membership” to join. DianaDuff is a plant adviser, educator and consultant living on an organic farm in Captain Cook. Copyright 2012 Kona Hawk Farms. Awesome Inc. theme. Powered by Blogger.